Solar panels on the roof of a Madison home. A UW-Madison engineer has proposed a new design for solar panels that can simultaneously generate and store energy. (Phys.org) —The potential energy available via solar power might seem limitless on a sunny summer day, but all that energy has to be stored for it to be truly useful. 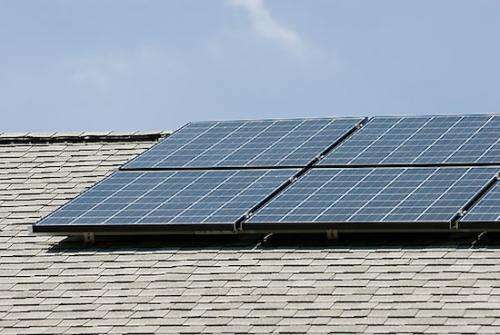 If you see a solar panel on a rooftop, in a large-scale array, or even on a parking meter, a bulky battery or supercapacitor is hidden just out of sight, receiving energy from the panel through power lines. However, that's a storage method that doesn't scale well for solar-powered devices with no space for a battery pack. In a quest for a smaller, more self-sustaining solar power source, a UW-Madison electrical engineer has proposed a design for solar panels that can simultaneously generate power from sunlight and store power reserves for later, all within a single device. Hongrui Jiang and his students developed the idea, published in the journal Advanced Materials June 6. Jiang is the Vilas Distinguished Achievement Professor of electrical and computer engineering at UW-Madison and specializes in microscale devices. He and his students developed the technology as an offshoot of a National Institutes of Health grant to design a self-focusing contact lens that adapts to the eyes of adults suffering from presbyopia, a natural aging process that stiffens the lens and reduces the eye's ability to focus, especially at short distances. To power that contact lens, Jiang and his team have worked out a design that balances energy harvesting, storage and usage. "We needed a multi-functional and small-form-factor device in order to integrate it all into a single contact lens structure," says Jiang. The top layer of each photovoltaic cell is a conventional photo electrode, converting sunlight into electrons. During that conversion process, the electrons split off into two directions: most electrons flow out of the device to support a power load, while some are directed to a polyvinylidene fluoride polymer (PVDF) coated on zinc oxide nanowires. The PVDF has the high dielectric constant required to serve as an energy storage solution. "When there's no sunlight, the stored power will come back through the nano wires to power the load." The final design allows for a standard-size solar cell that can simultaneously power a device and store energy for later use, creating a closed-loop system for small-scale applications of solar energy. "We can have some energy set aside locally, right in the panel, so that when you need it, you can get it," says Jiang. Other such solar panels—referred to as photovoltaic self-charging cells—have been around for a while, but the ability to provide energy continuously, rain or shine, sets Jiang's apart. Currently, Jiang's proof of concept converts only 4 percent of the sunshine striking the photoreceptor into usable electricity—and that's approximately 20 percent less efficient than most commercial solar panels in use today. However, as Jiang and his team refine the design from a standard-size photovoltaic cell to their specific use, they expect both the conversion efficiency and the amount of energy they can store to improve. Since the design scales up easily, says Jiang, microgrids—small scale power grids used to balance renewable power sources in energy-efficient buildings—would be another ideal application, since self-contained solar panels would limit the need for battery management and would allow engineers to design buildings that rely on the outside power grid even less than current systems. And there are futuristic applications: picture lighting systems that can be installed in remote areas—without running expensive power lines. "You could have one solar panel installed that will store the energy the system might need through nights and cloudy days," says Jiang.